- Identifying for implementation goals and strategies, including specific targets, indicators and milestones required to address the school priorities. At BSMS, our School Improvement Team meets twice a month, generally on the first and third Mondays of the month. See the calendar for dates. If you have feedback for the School Improvement Team, please contact Ms. Curtis at (919) 575-9429 or allenl@gcs.k12.nc.us OR fill out the feedback form on this page . 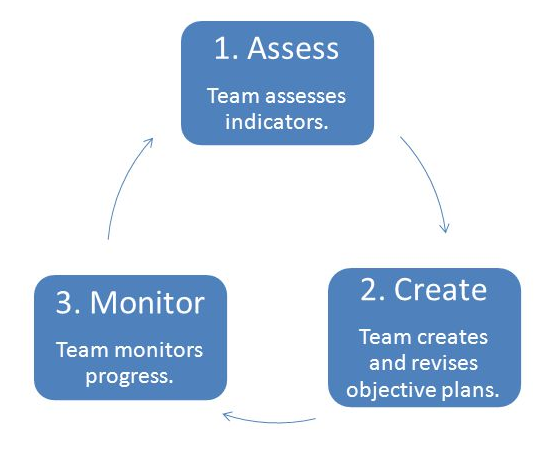 The BSMS School Improvement Team uses a Assess-Create-Monitor Cycle to implement changes to our school and evaluate the impact they have on student learning.